Well met, intrepid readers, and welcome to another pulp-laden pontification of the tabletop arts! Here are treasures to astonish—designed to dazzle the demystified and beguile even the most battle-hardened of heroes. We’ll study the lost arts of ancient civilizations and shining kingdoms beyond the stars with two super-science magic items for the Pathfinder Roleplaying Game, adapted from two celebrated pulp authors: the great Edgar Rice Burroughs and fan-favorite Robert E. Howard. I’ll spare you another recitation of the famed Arthur C. Clarke axiom regarding science and magic. But as Clarke and his contemporaries were shaping the philosophy of hard sci-fi, pulp fiction forerunners like Burroughs, Howard, Lovecraft, and Bradbury were weaving speculative tales that often blurred the lines between magic, metaphysics, and the “modern” world. The appropriately titled Super Science Stories was, in fact, one of the more popular pulp magazines of the 1940s (along with the likes of Weird Tales, Amazing Stories, and others), and ushered in a handful of prominent pulp-era writers like the aforementioned Bradbury, James Blish, and Wilson Tucker (who coined the term “space opera,” no less). Given the profound impact of pulp fiction on the development of tabletop roleplaying, it’s no small surprise how “super-science” has become part of the modern gamer vernacular. Star Wars, Masters of the Universe, ThunderCats, Krull…these beloved franchises are defined by their unique (and often bizarre) union of fantasy and science fiction. Gygax’s famed science-fantasy amalgam Expedition to the Barrier Peaks is likely the first instance of this kind of hybrid in tabletop gaming. Dave Arneson and David Ritchie’s Temple of the Frog is another classic example. 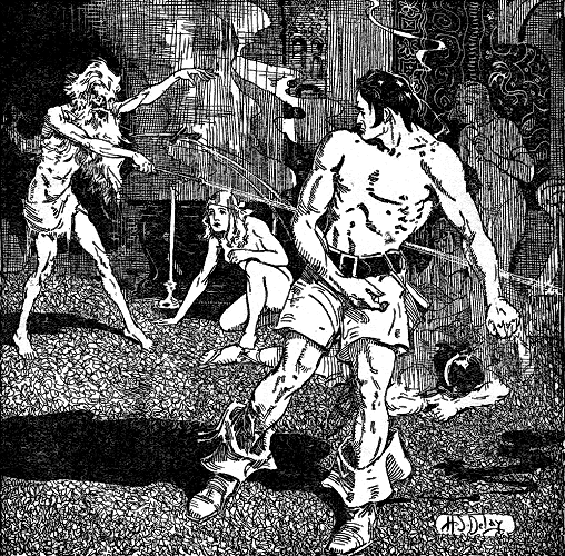 And if we look to the pulp authors who influenced our RPG progenitors (Howard and Burroughs among them), we can find ourselves armed with some pretty far-out additions to our games—inspired by time-honored tales of mystery and imagination. Our sources for this pair of peculiar curiosities include John Carter and the Giant of Mars by Edgar Rice Burroughs and “Red Nails” by Robert E. Howard. The Barsoomian “atom gun”—mentioned only a handful of times throughout The Giant of Mars—is a deadly piece of advanced tech and a welcome addition to any pulp armory. And we’ll head back to lost Xuchotl for “The Eye”—a devious item only the stygian minds of demon-haunted Hyboria could create. Can your players harness the power of the ancients? Or will these technological treasures help herald their doom? (It goes without saying, the Technology Guide by Paizo Publishing is an invaluable resource for informing your game with the proper mechanics of applied sciences. It’s not necessary for the content here, since you can refer to the Pathfinder Reference Document for the complete rules on radiation as a technological hazard). Slot none; Price 55,000 gp; Weight 11 lbs. This sleek, otherworldly +1 distance rifle harnesses the powerful anti-gravitational properties of the mysterious Eighth Ray to produce a miniature nuclear reaction. Incapable of firing ordinary ammunition, the Barsoomian atom gun is reliant on a special fission cartridge for the explosive force behind its deadly payload. A successful hit from this single-shot bolt-action rifle bombards the target with a round of concentrated gamma rays, inflicting 4d6 kinetic fire damage. Any creature that survives a hit from a Barsoomian atom gun also suffers the effects of low radiation. Forged from an alien carborundum aluminium alloy, a Barsoomian atom gun houses its trademark fission reaction within a specially crafted “null chamber” and subsequently issues no audible report when fired (making it effectively silent). Although the original techniques of its fabrication have been lost to space and time, the Barsoomian atom gun has been replicated terrestrially by savvy arcane weaponsmiths with a keen understanding of evocation and the inexorable laws of science. If a Barsoomian atom gun gains the broken condition, it begins to leak radiation and becomes a source of low radiation to all creatures that touch it. A Barsoomian atom gun that gains the destroyed condition becomes a source of medium radiation to those in contact with it and a source of low radiation to those within 10 ft. of it. Slot none; Price 30,000 gp; Weight 19 lbs. This 3-foot-long metal tube resembles a flat pyramid of telescoping bands with a narrow, crystal-paned lens on each end. These end segments are articulate up to 90 degrees and frame the length of a complicated contrivance of mirrors and lenses lining the device’s interior. Characters who look into the smaller end of “the Eye” can see out the opposite end, allowing them to safely peer over obstacles, around corners, or into small spaces where heads wouldn’t fit. When using the Eye of Xuchotl, the far end of the tube counts as a Diminutive object, making it less likely that an observed creature notices you; if you have total concealment from the creature except for the end of the Eye of Xuchotl, use the Eye’s Diminutive size modifier on your Stealth check instead of your own size modifier. Additionally, objects viewed through the Eye of Xuchotl are magnified to thrice their size. Characters using “the Eye” take a –1 penalty on Perception skill checks per 30 ft. (instead of the standard 10 ft.) of distance to the target, if the target is visible. A typical Eye of Xuchotl is too large and cumbersome to be used effectively by a Medium- or smaller-sized creature without the aid of a tripod and can accordingly be found among wall-mounted fortifications (if indeed one is found at all). I’m not much for putting tech items in my fantasy games. However,I do like the Atom Gun write up. I have not read the story it’s from but it sounds really cool. The image that comes to mind is a Tusken Raiders long rife. Enjoyed the article as usual Chris. Keep em coming!